Three years ago, we hosted a harvest party to celebrate our first anniversary as homesteaders. We made turducken. You can read all about it here. 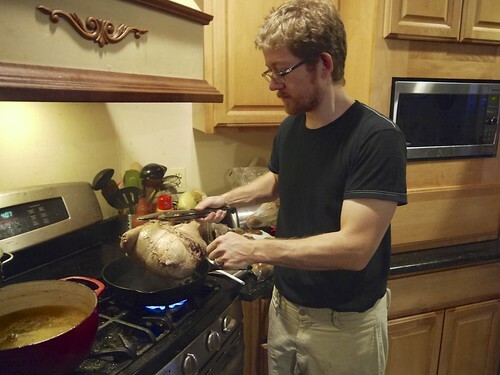 Essentially, you stuff a deboned turkey with a deboned duck that has been stuffed with a deboned chicken. It was AMAZING, but a whole lot of work. And, there were things about it that I didn’t love, like the soggy duck skin. I always said I would like to try to make it again, providing I found a better method. 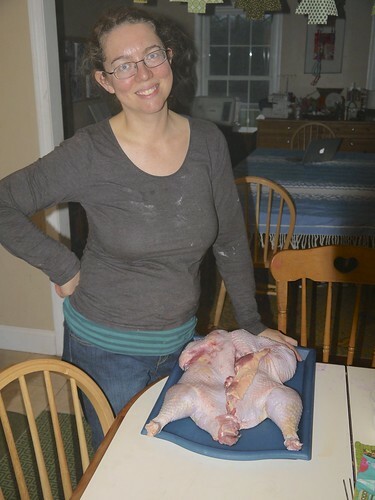 This weekend, we needed to do our final home butchering session. 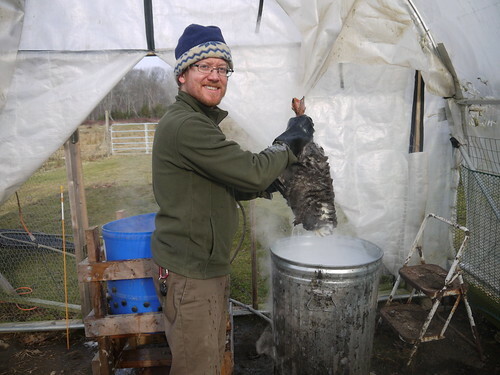 We had four turkeys to process, and since we had so many ducks and geese born on the farm this spring, we also needed to reduce their numbers. When we were finished, we had 4 turkeys (total of 60lbs), 4 geese (total of 25lbs), 6 ducks (total of 20 lbs) and 1 rabbit (4 lbs). 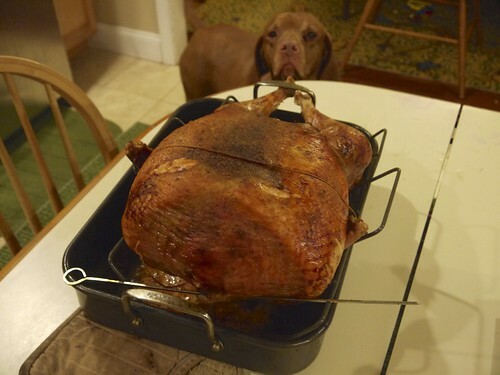 It seemed like we had the makings of a new version of turducken. Here are some pictures from our butchering session. We borrowed our friends plucker and it worked well with the ducks and geese. We heated the water very hot to scald them (about 155F) and put in a good bit of soap. We did the turkeys by hand. 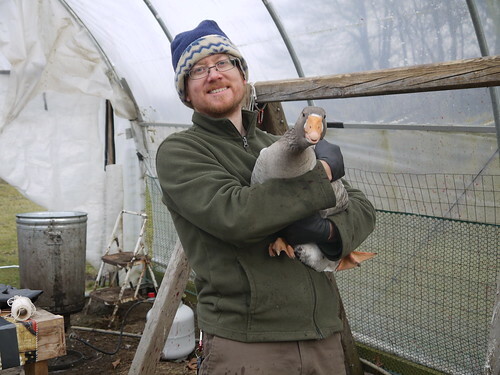 Mike with one of the geese. By adding in a chicken from the freezer, we had everything we made to make an epic “turoockenbit”. 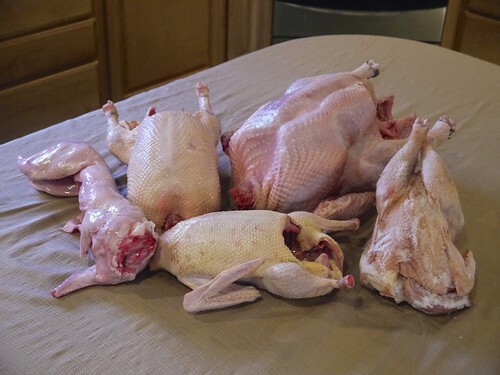 Turkey stuffed with goose, duck, chicken, and rabbit. I did a ton of research on the internet before getting started and came across this method from The Food Lab. Here are all of the animals, clockwise from far left is the rabbit, goose, turkey, chicken (it was frozen in the picture) and duck. I started by deboning the rabbit and made it into a forcemeat along with all of the hearts from the animals we butchered this session and the turkey livers. I pureed all the meat in the food processor until it was a paste and then added in some salt, pepper, and poultry seasoning. 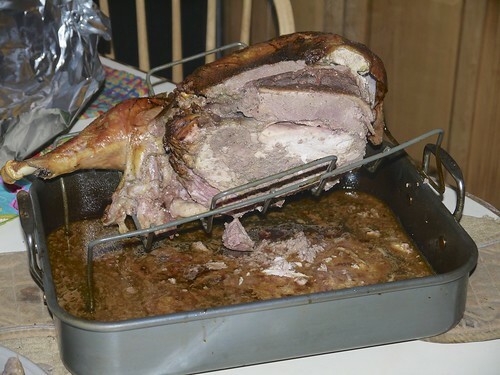 I deboned the chicken, put a good bit of forcemeat inside, trussed it and then poached it in water until it read 140F. 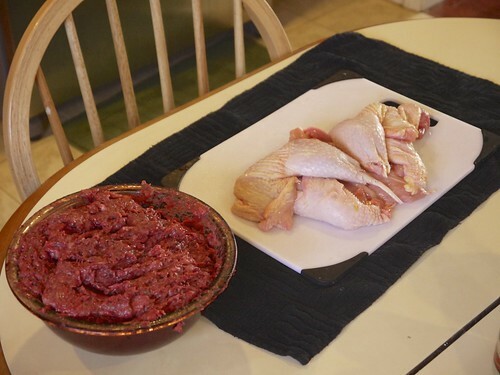 Rabbit and organ forcemeat and deboned chicken. Stuffed chicken ready to be poached. The last step was repeated one final time with the good, minus the forcemeat. 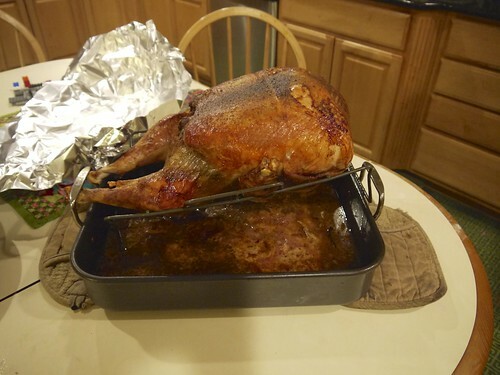 Once that was seared, we placed it into the turkey which had the keel bone removed, but the wings and legs were intact. 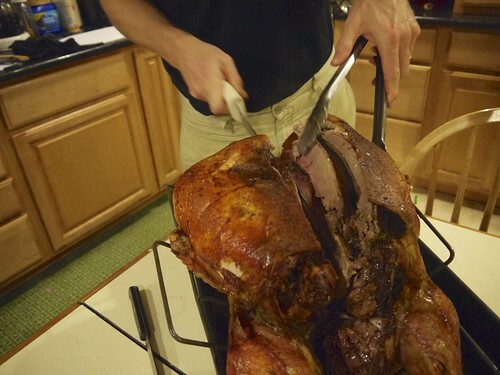 Mike searing the goose that has been stuffed with a duck and a chicken. 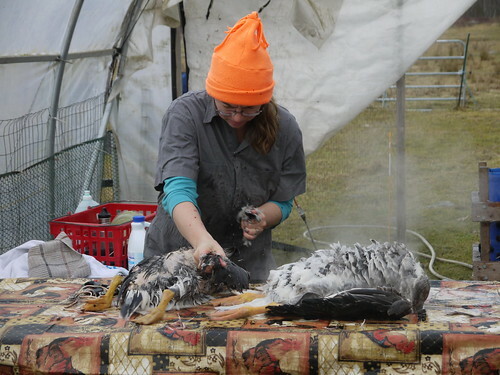 Deboning five animals in one day was pretty tiring. 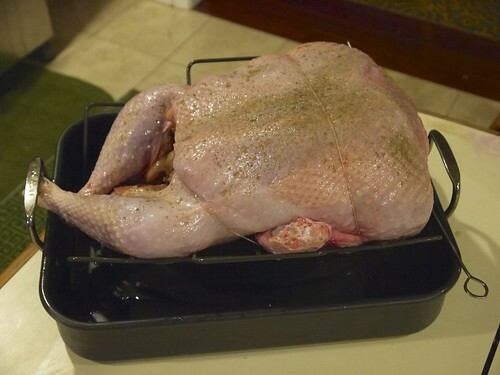 The turkey stuffed with the other poultry and ready for the oven. We roasted this in the oven at 425F for an hour and a half. It was pretty amazing. 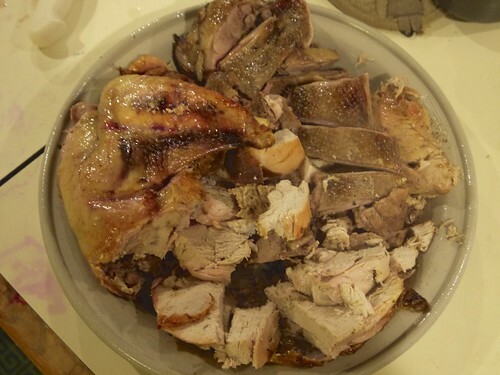 You can see all of the layers in this picture, starting with turkey, then goose, then the duck which slid towards the back and the chicken with a thick layer of forcemeat, which was very much like a country pate. Carving it was pretty easy. It tasted really yummy. But, in all honesty, after working on it for the better part of two days, when it came time to actually eat it, I was not as enthusiastic as I had hoped to be. Thankfully, everyone else loved it and there was plenty of veggies and apple pie for me 😉 I had a sample of all of the meats, and I think the chicken and goose were my favorites. It was great to tackle this recipe again. The instructions from The Food Lab were amazing and I highly recommend following them. Maybe I will be ready to make this again in three more years.